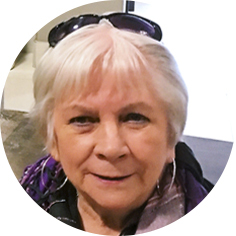 With great sorrow, the family of Norma Mildred Campbell would like to announce that Norma passed away in the Pasqua Hospital in Regina, SK on Tuesday, February 12th, 2019, at the age of 79 years, following medical complications. Norma was born in Foam Lake, SK on July 8th, 1939 to Margaret Gudrun (Narfason) and Edward Chapman (Ted) Campbell. She was predeceased by her parents; sister, Joan Kerr; brother-in-law, Bob Kerr; and sister-in-law, Diane Campbell. Norma is survived by her brothers: Tom (Faye), Doug (Fran), and Don Campbell; daughter, Sherrie (Neil) Holmes; grandson, Erik (Rachel); son, Chris Olafson (Shelley); grandchildren, Carson and Kiana; the father of her children, Garry Olafson; her spouse, Lorne Jackson; and step-children: Allan, Rena (John) Park, Jeremy, and Tara Hamilton; as well as many beloved nieces and nephews. Nothing was more important to Norma than her family. She was always so very proud of her kids and grandchildren and although there was great distance, it never felt that way. She ensured that everybody stayed connected via frequent phone calls and more recently, Facetime. Her visits were always filled with home cooked meals, wonderful and hilarious conversation, far too many treats, and countless card games accompanied by tea. Norma had such a quick wit and great sense of humor. A kind, caring and compassionate woman who always looked out for those in need. There are so many things that Norma did in her lifetime, so many she touched, and so many ways in which she will be remembered. Her life lessons and her love will forever live on in the hearts of her family and friends. We are so blessed to have such wonderful memories of her and will hold her close. She will live in our hearts and minds…always. Till we meet again…Rest easy. In keeping with Norma’s wishes, a Private Family Service will be held. In lieu of flowers, the family would ask that people who knew Norma perform an act of kindness in her honor. Arrangements are entrusted to Moose Jaw Funeral Home, 268 Mulberry Lane. James Murdock, Funeral Director 306-693-4550. We are so very, very sorry to hear of Norma’s passing. She was a wonderful person and such a good friend to Mom. Hopefully, they are catching up on old times. I know you will all miss her very much. Our deepest condolences to you all. Thank you so much Joan and Clayton. I sure hope those two are catching up. A sweet, thoughtful & caring woman. I met Norma when she lived on the farm in Riverhurst and we quickly became friends! I always looked forward to hear about her family. She was so proud of each of you. Her artistic flare shined through her home, flower garden and the renovation to a building on the farm that became like a fairytale cottage. I will be thinking of Norma today when I do an act of kindness in her honour. She will be missed. Deb, thank you so very much for your kind words about my Mom. 1Corinthians 15: 22- 26. May you day be blessed. To the families of Norma. Wishing you my deepest sympathies in the loss of your Mom. She was a very special kind of lady with a gentle soul. She will be missed . Chris and family-Sorry to hear of your Mom’s passing. I ran into her quite often around town and at the hospital, she always remembered who I was. She was a kind and gracious lady. No matter how well or unwell she felt, She always wore at least one piece of Jewellery. She once said, “ I am like a old crow, I am attracted to anything with Bling”. But, my favourite woren piece, was her smile, followed by her laugh. Lorne, Sherri, Chris and families. Gord and I have so many memories that go way back to the time we came to Moose Jaw in 1961. We spent time together when Sherri and Chris were young. We know Norma as a friendly and caring person. Each time we met, both she and Lorne were so willing to update us about family and grandchildren. She will be missed. Take care. Cherish your memories. Thank you Gord and Darlene. She always valued your friendship and I thank you for that. We’ll hold her memories close in our heart till we meet again. Norma was my cherished friend. Her compassionate and loving nature endeared her to a host of friends. She will be greatly missed. Leslie! I’m so glad to hear from you. Thank you so much for your beautiful words about Mom. Going forward I will cherish her memories and try to make her proud. I first met Norma at Teachers College. She sat in front of me. She was very quiet and she had a dry sense of humour. We had many good laughs. We renewed our friendship when we moved to Moose Jaw in 1962. She was always a caring, gentle person. Thank you Claude! … she had such a sly, dry sense of humor and quick wit. She had me in hysterics many a time. I will miss that…. and her. Always. Saddened to hear of Norma’s passing, she was a fabulous lady. I’m blessed I got to share her passion for Lilies and all the gardening tips she shared with me. Sending warm thoughts and great memories of an amazing lady. Your mom was never too busy to stop and chat. I am very sorry for your loss.